IDL = a Mark of the Beast? Do you know that when you seriously study, research, observe and review your subjects on geography, history of the world, and physics in high schools, colleges, and universities, you will find that they are not what they published and taught as such? You will find that your own country's history, family's religious backgrounds, your knowledge and understanding on the Bible, Christianity, comparative religions, Perspectives on the World Christian Movement, theology, and practices are not what they are ... At least 99.5% of the religious believers and followers, regardless of their origins from the East and West, denominational, independent, and peculiar faiths of the estimated 40,000 churches and religions worldwide do not know or care to know that they have been observing the wrong time and day on the Fourth Commandment and the annual Holy Days! "On Wednesday, the ninth of July , we arrived at one of these islands named Santiago, where we immediately sent the boat ashore to obtain provisions. And we charged our men in the boat that, when they were ashore, they should ask what day it was. They answered that to the Portuguese it was Thursday, at which they were much amazed, for to us it was Wednesday, and we knew not how we had fallen into error. For every day I, being always in health, had written down each day without any intermission. But, as we were told since, there had been no mistake, for we had always made our voyage westward and had returned to the same place of departure as the sun, wherefore the long voyage had brought the gain of twenty-four hours, as is clearly seen." Two years and 10 months earlier, Ferdinand Magellan (1480 - 1521), the famous explorer and navigator took command of the 237 men in a 5-ship armada, which departed from San Lucar de Barrameda, Spain on September 20, 1519. The Portuguese colonizers sailed to the Spice Islands in Moluccas, Indonesia via the eastward route, in which Pope Alexander VI had granted them as their monopoly in 1493. To avoid this papal decree, Magellan (a former Portuguese citizen) led his Spanish Armada in a search for the Spice Islands via the uncharted west. While in South America, Magellan lost one ship, the Santiago and its crew, during an exploratory trip. Another ship was lost when the crew of San Antonio mutinied and sailed back to Spain, carrying the fleet's food supplies with them. With 3 ships remaining, the malnourished Magellan and his starving men discovered the vast Pacific Ocean and its islands including Guam and the Pearl of the Orient - composed of 7,600 islands. In the Philippines, they first anchored a few days in the uninhabited Homonhon Island, east of Leyte, for replenishment. Sailing in the evening along the coast of southeastern Panaon Island, they saw a bright light shining from another island and headed towards it. The light came from Limasawa, Southern Leyte - "Asia's Cradle of Christianity." Magellan and his men waited off the island until daybreak. Later on, they exchanged gestures of friendships with Rajah Kulambo. Kulambo and his "barangay" welcomed them with drinks, foods, and festivities. Magellan and Friar Pedro de Valderrama introduced Catholicism with a Mass to the inhabitants on Easter Sunday, March 31, 1521. About a week later, they proceeded to Cebu in which Magellan introduced the Santo Niño (Holy Child) and the cross to Rajah Humabon. Magellan got himself involved with the domestic conflicts between Rajah Humabon and Datu Lapu-Lapu, so much so that Magellan and 8 of his men, unfortunately, met their fate in Mactan, a flat island east of Cebu. Lapulapu, the chieftain of Mactan, killed Magellan after the explorer and some of his troop landed on its shore. Juan Sebastian del Cano, a former mutineer against Magellan, assumed command of the few European survivors and a Malayan. They abandoned and burned the Concepcion near Bohol for lack of crew. Then they sailed southward to the Spice Islands and eventually achieved their ultimate goal on November 6, 1521. Left behind for repair works on its leaking hull and after it was loaded with spices, the Trinidad tried to go back to the Pacific Ocean to guarantee that one ship will make it home. Strong winds prevented the ship from sailing eastward and the Portuguese later seized it. From Indonesia, the Victoria and her crew sailed westward. They managed to evade and cross their enemies' trade routes in the Indian Ocean and around the coast of South and West Africa... Finally, they returned to Spain on September 6, 1522 (actually the 7th). When Victoria, the only surviving ship, returned to the harbor of departure after completing the first circumnavigation westward around the Earth, only 18 men out of the original 237 men were on board. The inquisitive person might ask, "Who was right? Since Pigafetta and the Portuguese traveled from Southern Europe in opposite directions, and suppose they met in the Spice Islands instead of Cape Verde, was Pigafetta accurate in dating his logbook or was the Portuguese right?" If both were Jewish or Sabbath-observing Christians and had met on Saturday in accordance with Pigafetta's logbook, the Portuguese would be working on the day that Pigafetta would be keeping as holy. Where in the Holy Bible did the Creator command that His people in the East are to observe the Sabbath day ahead of those in the West? Did He command the natives in the Philippines, the 3rd largest English-speaking country, to keep the Sabbath nine hours ahead of those in the United Kingdom, which is the 2nd largest English-speaking nation? Did the Lawgiver order the Australians to worship on the seventh day of rest ahead of the Americans? When man invented rapid means of transportation and communication, and the industrial revolution spread to some nations around the world, it became an economic and social necessity to fix a standard date and time. According to the Encyclopedia Americana, "in August 1884 the U.S. Congress authorized President Chester A. Arthur to convene an International Meridian Conference, which would consider a proposal for a system of world time zones and a common zero degree of longitude, and recommend acceptance of it." They ignored or rejected the calendar of the Holy Bible that had been used for almost six millennia. Man, not G-d, set the International Date Line as the standard date-change position for the midnight-to-midnight calendar. The International Date Line (IDL) is an imaginary longitudinal zigzag line running from the North Pole through the Bering Strait between Alaska and Siberia, going down the middle of the Pacific Ocean and to the South Pole. It deviates eastward to avoid dividing Siberia, westward to include the Aleutian Islands with Alaska, and eastward to make the date of certain islands in the Southwest Pacific the same as in New Zealand. Extending from the North to the South Pole, the IDL is 180 degrees from the Greenwich Meridian - the "zero degree of longitude" - located in Greenwich, England. Areas west of the IDL are one day ahead of the east side of the dateline. For example, when one travels westward across the IDL, they change from Saturday to Sunday. When one travels eastward across the same dateline at the same time, the areas change from Sunday to Saturday. Physics teaches that light travels in a straight line, so naturally, the sunset shadow along the IDL should be straight from the North to South on the equinoxes. But the zigzags in the IDL alter the shadow line. When it is Friday sunset in the Aleutian Islands, it is supposedly Saturday sunset in Eastern Siberia. Around 30 years ago, there was an article in the National Geographic on the Aleutian islands southwest of Alaska. It showed a picture inside a restaurant somewhere in one of the Aleutian islands, in which the restaurant owner intentionally placed his dining table with a painted colored line to divide the customers east and west of the International Date Line. The IDL ran through the entire small island. His colored line on the dining table which separates the 2 calendar day actually attracted the tourists and customers to his restaurant. In other words at the International Date Line, these two groups of Sabbath-keepers, despite observing the same sunset at the same moment, are keeping two different seventh days. Each new day of the biblical calendar starts in the evening, not from midnight to midnight. The Sabbath - the seventh day of the week - begins on Friday evening in most of the world (Genesis 1:5 - 31; 2:1-2). G-d, the Creator of planet Earth did not authorize the zigzag International Date Line. The International Meridian Conference authorized it. They were responsible for tampering with Elohim's Sacred calendar! Though light travels in straight line, for their own convenience they deliberately bent the IDL around Eastern Siberia, the Aleutian and South Pacific Islands. the law that light travels in straight line. An excellent example of the arbitrary nature of the IDL happened in the Philippines: "During the early 1840s the commercial interests of the Philippine Islands turned more and more away from the Spanish America's (which for a large part had severed their relations with the mother land Spain) and trading with the Chinese mainland (engendered by the ignominious but lucrative 'Opium Wars'), the Malay peninsula, the Dutch East Indies and Australia became increasingly important. In order to facilitate communication and trading with its western and southern neighbors, the secular and religious authorities of the Philippines agreed that it would be advantageous to abolish the American day reckoning and adopt the Asian day reckoning. This was achieved in 1844 when Narciso Claveria, the governor-general of the Philippines, issued a proclamation announcing that Monday, 30 December 1844, was to be immediately followed by Wednesday, 1 January 1845. Outside of the Philippines, the fact of the adjustment was little noticed and up to the early 1890s many European atlases and geographical handbooks still maintained that the Philippines observed the American day reckoning." From 1565 to 1845, since the first Spanish Governor-General Miguel Lopez de Legaspi (c. 1510 - 1572) had established Spain's Far East colony, the Filipinos and Spaniards had followed the calendar date of the Latinos in Central and South America and the North Americans. For 280 years, the Filipinos and Spaniards followed the religious holidays and feast days which began in Spain (or Rome, Italy). As the circle of illumination moved from Rome or Spain, then to Latin America, and about 15 hours later, the Filipinos observed the religious holidays and feasts in the Philippines as the Earth turned on its axis. After this date change, the religious holidays and feast days started in the Philippines, then they moved to Spain and the religious Latinos and Latinas observed the holidays and feasts 11 to 15 hours later in Latin America. What then is the significance of the International Date Line? To the non-Sabbath keeping world, to the material-oriented inhabitants of today's society, it has economic, social and even political values. But to the Jews, Messianic Israelites and Seventh-day Christians living in the East, it can cause them to live in sin! If, as we show below, the present IDL is wrong, it means that the Sabbath-observing churches, synagogues, and individuals that are living between west of the IDL and east of Eden have been violating the Fourth Commandment (Exodus 20:8-11). They have been violating the annual Sabbaths or Holy Days (Leviticus Chapter 23). The correct Sabbath observance in the entire region from west of the IDL to east of the Garden of Eden has been lost for millennia! Observing the true Sabbath including the annual Sabbaths (Leviticus 23:3-41) is the SIGN between G-d and His chosen people throughout their generations (Exodus 13:3-10, Exodus 31:13, Hebrews 4:4-10). The Israelites and the converted Gentiles are to observe the Sabbath, celebrating it as the lasting covenant. "It is a sign between Me and the children of Israel forever; for in six days Jehovah made the heavens and the earth, and on the seventh day He rested and was refreshed" (Exodus 31:17). From portions of the Far East to the Middle East, over 99.5% of the Sabbatarians have unknowingly kept the Sabbath on the sixth day instead of the biblical seventh day of the week. Whereas, the Sunday worshipers - the Roman Catholics and Protestants - of these areas are unaware that they have observed around 18 hours of the actual seventh-day Sabbath! Nevertheless, those who work regularly on the Sabbath, including the non-Christians, have part of the Mark of the Beast by virtue of the IDL! The IDL was deliberately bent to compromise with the "powers that be"! The beast (Satan) that influenced the location of the IDL deceives everyone in the east, famous and insignificant, billionaire and homeless, citizen and foreigner, into receiving a mark (Revelation 13:16-17). On the Sabbaths, Bible-believing Christians avoid buying, selling and working or doing business, which are some of the marks of the beast. Satan has also inspired the European Union to change their calendars so that Sunday now appears to be their seventh day of the week. The United Nations plans to copy this beast-inspired calendar. This will make it harder for the people globally to really know which day is the seventh day of the week. But why care about the beast and its mark? Those who do not worship the beast and refuse to receive its mark will be in the first resurrection. They will be seated on thrones and given authority to judge. They will be the priests in the Kingdom of G-d on Earth. Those who have G-d's mark will reign with Christ for a thousand years (Ezekiel 9:1-10, Revelation 20:4-6). If the current International Date Line is wrong, where did G-d originally place the IDL? Where is it now and where will it be in the future? If the first Sabbath started at the Bering Strait between the west coast of Alaska and east coast of Siberia, why did G-d bless and declare the seventh day holy, while at the same moment, He was still working about 9 in the morning of the sixth day in Eden? Prior to the first or original Sabbath, G-d had just created Adam and Eve on the sixth day. "And God blessed the seventh day and declared it holy because on it God ceased from all the work of creation which He had done" (Genesis 2:3). "And the Lord God planted a garden eastward, in Eden and there He put the man whom He had formed" (Genesis 2:8). Eden was located north, northeast of Jerusalem, as shown in Genesis 2:10-15. Armenia, the very first country to accept Christianity as its official religion, believed that the Garden of Eden was in Armenia! Eden was about 9 hours west of the IDL at Bering Strait. G-d was already in Eden with Adam and Eve on the sixth day (Genesis 1:27-31). He did not need to travel westward from the IDL to rest in Eden after finishing His Creation. The Bible plainly stated that "on the seventh day God finished His work which He had made; and He rested on the seventh day from all His work which He had made" (Genesis 2:2). After the fall of Adam and Eve, G-d exiled them from the Garden of Eden (Genesis 3:23). Then G-d placed an angel and a flaming sword flashing back and forth on the east side of the garden to prevent them to the way to the TREE OF LIFE (Genesis 3:24 NIV). Therefore, the first Sabbath began at the site of Adam and Eve's original home about 6,000 years ago. It did not start at the IDL, which existed only in 1884 C.E. or 131 years ago. The Sabbath was made for man (Mark 2:27), not for the fish and the whales in the mid-Pacific Ocean. When the first Sabbath started at Eden, just after sunset of the sixth day, the rest of the world was still the sixth day. About 12 hours later, as the Earth rotated on its axis and dusk or the circle of illumination moved westward from the Garden of Eden, the Sabbath had covered everything between west of Eden and east of Hawaii's Big Island or in Tahiti. Half of the Earth was in the first seventh or Sabbath day, while the other half was still completing the sixth day or Friday. Furthermore, as G-d's Sabbath began at Eden, the true Date Line must also be there. Moving the dateline eastwards to the Bering Strait or the mid-Pacific Ocean makes the Sabbath begin there 9 hours too early, and over a third of the globe too far east of Eden. 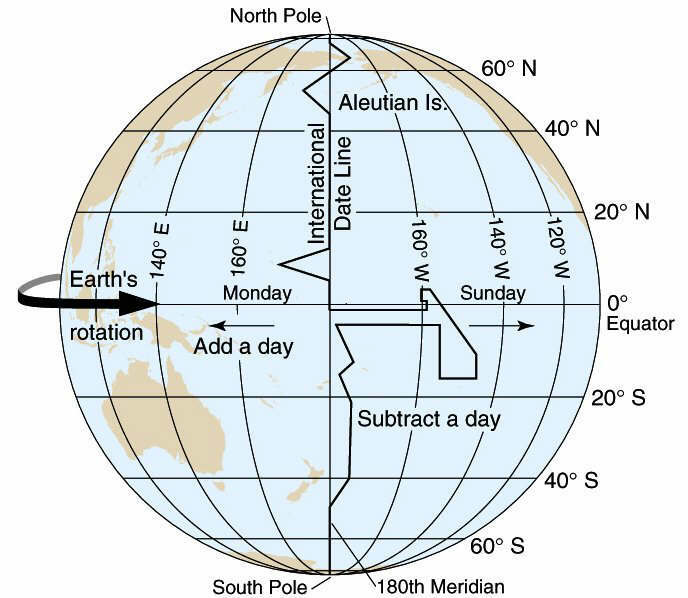 Substituting G-d's Date Line for man's International Date Line means that the people living between west of the IDL and east of Eden east are going to observe their Sabbath too early - from one to nine hours. Today's true Sabbath, as it was almost 6,000 years ago, starts in the evening. The circle of illumination moves westward from Eden/ Mount Sinai/ Israel dateline, and covers around the globe as the Earth rotates on its axis. It takes 24 hours for the seventh-day Sabbath to return back to its point of origin, which then becomes the first day of the week or Sunday. Under the IDL, the seventh day which starts in the middle of the Pacific Ocean or between Alaska and Siberia is actually the sixth day of the week, occurring before the real Sabbath begins. So we see that the first Sabbath of the creation week (Gen. 1:1-31; 2:1-2) is the key to understanding how G-d's Sabbaths work. In Romans 1:16, it implies that the Sabbath observance, like the gospel, should go to the Jews first, then to the Gentiles or other nationalities. The fact is that the Earth always rotates on its axis from the Middle East to the West, then to the Far East and westward back to the Middle East, rather than the other way around! The Sabbatarians living west of Eden, occupying all of Israel, most of Africa, Europe, Scandinavia, Canada, United States, Mexico, Central and South America, must observe the Sabbath day ahead of those living east of Eden. They first must rest and worship God on the Sabbath from Friday evening to Saturday evening, the same as they do presently. Meanwhile, the Sabbatarians living east of Eden, inhabiting most of Russia, Mongolia, China, India, South Korea, Japan, Philippines, Australia, New Zealand, and the rest of Asia, have to work and wait until the seventh-day Sabbath reaches them after it moves westward to most of the world. The Seventh-day keepers in the Far East or west of the mid-Pacific Ocean to east of the Garden of Eden must keep the Sabbath behind their brethren in the West. Thus, the Sabbath keepers living west of the IDL to the east of Eden must remember that their secular calendars are one day ahead or from one to 9 hours too early. For them, the seventh-day Sabbath begins at dusk - Saturday evening and continues until dusk or Sunday evening. A few of the modern Christians wrote articles regarding the IDL in the magazines and the Internet. They quoted Genesis Chapter 1 which they interpreted to mean that the Sabbath had to start at the big ocean - the Pacific; that the Jews or the Lost Tribes of Israel had kept the right Sabbath when they migrated as far as Siberia or down to Australia and New Zealand. However, though the Earth had been known to be spherical, not flat, as early as the 6th century B.C. with Pythagoras, who was followed by Aristotle, Euclid, Aristarchus, and others, no one had actually determined where on Earth the Sabbath or any new day was to start. Even among the Christian circumnavigators and explorers from the 15th to 18th century, no one knew of the importance of having a dateline until 1884 C.E. Multitudes of the Sabbath-keeping churches and congregations follow the Jewish way of keeping their weekly Sabbath - from evening to evening - but, unlike the Jews, many of them do not observe the yearly Sabbaths. 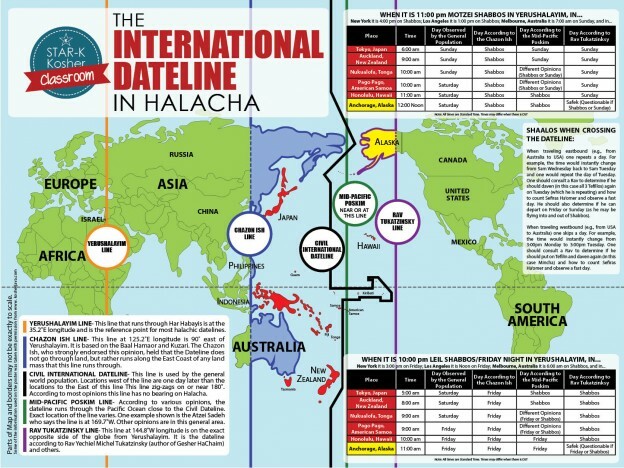 Most of the Orthodox, Conservative, and Reformed Jews follow the International Date Line to observe their weekly Sabbath, but they practice tradition or use the inaccurate calculation to observe their annual Sabbaths. The well-known Jews and those that practice Judaism, however, are not the only followers of the Old Testament. The unknown Karaites, who claimed to be the original religious group of the Hebrew Bible, use the visible observation of the new moon as seen from Jerusalem. They use the Biblical New Moon/Abib Calendar to keep the yearly Sabbaths. Majority of the Sabbatarians around the world are neither aware of the Karaites' existence nor Pigafetta's experience, which is the main reason why the Sabbath observance starting at Eden/Jerusalem makes no sense to them. A. Jan Marcussen, a Seventh-day Adventist pastor in Illinois, U.S.A. will reward $1 million dollars to anyone who can prove that Sunday is the Sabbath day! Many Christians say, "We worship on Sunday because we believe that Christ was resurrected on Sunday. The Sabbath was nailed on the cross!" They reject these Biblical facts: Yahshua/Christ came not to change the Law or the Prophets, but to fulfill them (Matthew 5:17). He was crucified on the Passover day. Even the Encyclopedia Britannica and other respected reference books agreed with this. However, on the year of Yahshua's crucifixion, the Passover fell on Wednesday, not on a fixed Friday that was (and is) observed as part of the Easter tradition - being practiced by some Gentiles even before the Savior was born. Yahshua was placed inside the sepulcher just before sunset of the annual Sabbath or first day of the 7 days of Unleavened Bread (Exo. 23:15), which fell on Wednesday evening or sundown. It was not on Friday from which at sundown or sunset, the weekly Sabbath started. That holy day, which followed the Passover at sundown, was the first evening of the 7 days of the Feast of Unleavened Bread (Luke 23:53-54, Leviticus 23:5-7). Yahshua's resurrection after being dead for 3 days and 3 nights was the SIGN that He was (and is) the Messiah (Matthew 12:39-40). It was not until early Sunday morning, before dawn, that Mary Magdalene, Mary the mother of James, and Salome went to the sepulcher and found that it was already empty. (Mark 16:1-6; 9-20 do not have these verses in the earliest manuscripts and in other ancient witnesses). "Jesus had risen from the dead at dusk on the previous evening and left the tomb, exactly fulfilling the Sign of Jonah!" Yahshua's death and resurrection did not change the Sabbath from Saturday to Sunday. Satan had deceived millions of Christians into believing that the seventh-day Sabbath was nailed to the cross. It was the list of our sins against G-d's Laws that was nailed to the Cross, not G-d's Laws! Satan had used (and has been using) the world's religious, educational, economic, social, and political establishments - United Nations, EU, ASEAN, APEC, New World Order, Future World Order - to convince billions of the people to violate Jehovah G-d's weekly and yearly Sabbaths, and thus receive a Mark of the Beast. The same principle of keeping the weekly Sabbath applies to the Annual Sabbaths (Leviticus 23:6-36). Indeed, the Annual Sabbaths confirm the use of "Eden" as G-d's Date Line. The dates of the Annual Sabbaths of the Karaites' calendar are determined on the basis of the observance of the New Moon in the evening at Eden/Jerusalem. Each New Moon is the beginning of the new month in G-d's Sacred Calendar. There are some months in which the New Moon will not be visible, for instance, in Siberia, Japan or New Zealand. If the Sabbatarians continue to use the IDL, they will be observing their new month hours before they know whether the New Moon will be visible in Jerusalem or not. In the case of the seventh month, the first day of the month is the Feast of Trumpets, a holy convocation (Leviticus 23:24-25, Numbers 29:1). It is logical to celebrate the annual sacred day after that of Jerusalem's date and time, so they can be sure that they will be keeping the correct Feast of Trumpets and other yearly holy days. The Feast of Trumpets signifies the herald of the Messiah's Second Coming and He shall return to Mount Olives, east of Jerusalem (Zechariah 14:4). The inhabitants living in the Far East to the Middle East that continue to use the IDL, if they survive through the Great Tribulation, will find themselves celebrating the biblical feast before Yahshua, the Celebrant, will partake of the same occasion. Their advance celebration is like the guests eating the wedding cake before the groom - Christ - marries his bride - the Church (Rev. 19:7). On the Passover, Unleavened Bread, Pentecost, Feast of Trumpets, Day of Atonement, Feast of Tabernacles, and Last Great Day, the churches and nations that are located from west of the IDL to east of Jerusalem will have to schedule their yearly religious activities behind those of Jerusalem's date and time. Yahshua or Jesus and His parents, Mary and Joseph, observed every year the Passover, Feast of Unleavened Bread and other feasts. They went to Jerusalem to keep the Annual Sabbaths (Luke 2:41-43, Lev. 23:4-44). The Apostles and the early New Testament Church members did not go to the Holy City and other places to celebrate the New Year, St. Valentine's Day, Easter, Halloween, All Saints Day, Christmas, or any one of the non-Biblical feasts, festivals and holidays! When the Messiah returns as the King of kings and the Lord of the Sabbaths, He will establish His headquarters in Jerusalem forever (Ezekiel 43:1-9, Matthew 24:27-31, Acts 1:9-12). He and His angels, the transformed Christians and the survivors of Armageddon will be the first to observe the weekly and annual holy days in Jerusalem. They will be the first to rest from work, to celebrate the evening Sabbath, to worship, to enjoy the dinner and fellowship. The following day, they will be the first to have a potluck meal after their daytime Sabbath services. The mid-Pacific IDL corrupts this divine order. In Zechariah, writing about the future when the Kingdom of G-d is established and the headquarter will be in Jerusalem, Zechariah wrote in Chapter 14: 16 to 19: "And it shall be that all who are left from all the gentiles which came up against Yerushalayim, shall go up from year to year to bow themselves to the Sovereign, YHWH of hosts, and to observe the Festival of Booths. And it shall be, that if anyone of the clans of the earth does not come up to Yerushalayim to bow himself to the Sovereign, YHWH of hosts, on them there is to be no rain. And if the clan of Mitsrayim does not come up and enter in, then there is no rain. On them is the plague with which YHWH plagues the gentiles who do not come up to observe the Festival of Booths. This is the punishment of Mitsrayim and the punishment of all the gentiles that do not come up to observe the Festival of Booths" (from the Scriptures, a Messianic Holy Bible translation). If we have electronic communications then, the Messiah's sermon will be progressively telecast around the world as the Sabbath moves into each area. Before the Sabbath reaches other regions of the globe, G-d's people will be working and preparing prior to the day of rest. Then, they too will be observing the Sabbath in their homes, churches, and synagogues as it comes eventually into their respective time zones. All of the people living between east of Eden/Jerusalem (perhaps a Sabbath day's journey to and from Jerusalem) and west of the mid-Pacific IDL will observe the holy days following the Israelites: "From one new moon to another and from one Sabbath to another, all mankind will come and bow down before me, says the Lord" (Isaiah 66:23). The weekly and annual Sabbaths have not been, and will not be done away with. As an example, G-d warns all the people that He will punish the nations that do not keep the Feast of Tabernacles (Zechariah 14:16-19). The Feast of Tabernacles is a foretaste of the Messiah's millennial rule on Earth for Mankind. The entire world will then acknowledge G-d's Date Line, which is about an hour east longitude of the temple in Jerusalem where His Son will be living. G-d's Date Line is designed for physical and spiritual rejuvenation, unlike the world's system which is made for economic, social and political reasons. His weekly and annual Sabbaths will enrich the lives of all the people, including those living in the proximity of the original dateline. For sure if the United Nations would miraculously recognize and mandate the original dateline near Babylon or next to the less inhabited boundary from north to south-east of Armenia where the Garden of Eden was supposed to be, some entrepreneurs will make fun of the Garden of Eden Date Line. Some well-known international hotel corporations, multi-national companies, celebrities, etc. will intentionally build their properties to include the east and west wings! Contrary to the supporters of the mid-Pacific dateline, the new dateline in Eden will not cause any confusion. The one-hour longitude from Jerusalem is also near the vicinity of old Babylon which is in Iraq. In the coming millennial rule of Yahshua on Earth, the survivors of the Great Tribulation will obey the observance of the weekly and annual Sabbaths including those that prefer to live near the longitudinal line immediately east of the Garden of Eden. Those who are willing to obey the Fourth Commandment and the Annual Sabbaths will make plans days ahead not to cross G-d's Date Line. Even today, when the people truly obey the weekly and annual Sabbaths, they make plans ahead not to travel too far, not to work overtime, not to buy too many groceries shortly before the Sabbath, not to do errands and other activities which they could break the Sabbath observance. The survivors of the Great Tribulation and the new generations born in the Thousand Years of Peace will be excited and delighted to keep G-d's Sabbaths in the coming Kingdom of G-d on Earth. Who among the survivors of the Great Tribulation, Battle of Armageddon or World War 3, and Wormwood would question the authority as to the original or new date line? The Almighty Creator can shift the North and South Pole to new ones in such inclination so that the east side of His Date Line will be in less populated zones or an ocean where the imaginary longitudinal line does not intersect an island. He can shift the Earth so that most of Antarctica, which is larger than the United States of America, will be near or in line with the new equator as the Earth turns on its new axis. He can shift the Earth so that most of the bigger continents will be in line with the new equator to utilize the majority of the areas as tropical lands. He can tilt the Earth so that the angle of incidence at the equator would be at least 80 or less from the sun's rays. Nevertheless, there will be ice and snow in the new North and South Pole. Thus in the coming Kingdom of G-d on Earth, there would be no extreme season, but well distributed fine weather throughout the years, centuries and millennium! In 1522, man discovered that a day was lost when Magellan's surviving crewmen sailed westward and circumnavigated the world. In 1884, men agreed on their International Date Line, which YHWH or Elohim did not authorize. It deceived all the Sabbath and non-Sabbath keepers living between west of the International Date Line and east of the Garden of Eden into violating the Fourth Commandment and receiving one of the marks of the beast! The very first Sabbath observance originated around 6,000 years ago in Eden, where the Creator rested after He created and put Adam and Eve in the garden. It was, and still is, the site where the New Moon was first observed that began each month on the Sacred Calendar of YHWH. Yahshua kept the Sabbath when He was in Jerusalem, which will also be the same city where He will observe each Sabbath, not Sunday, in the coming Millennium of Peace. Having YHWH's Holy Spirit and honoring His seventh-day Sabbath are signs between the Creator and His people of the everlasting covenants! Those who love Him and keep His commandments do not have a Mark of the Beast. They will be in the first resurrection and will reign with the soon-coming Messiah for a thousand years (Rev. 20:4-6). The Word, the Creator of the Heavens and the Earth, and the same One who died for all mankind said: "For whoever does the will of my Father in heaven is my brother and sister and mother" (Matthew 12:50 NIV). He also said: "If you love me, keep my commandments" (John 14:15 KJV). Finally, He promised to return and said: "Behold, I am coming soon! My reward is with me, and I will give to everyone according to what he has done" (Rev. 22.12 NIV). Six millennia ago, the Lord of the Sabbaths rested on the Seventh Day from His works of creation. He did not observe the Sabbath on the First Day or Sunday. The Savior's Sabbath started not at today's International Date Line, but at the beautiful Garden of Eden! Let us follow our Savior's example and truly honor His weekly and yearly Sabbaths! Date Line Deception: What it is & Why it matters! Where is God's International Date Line?